POWERFUL SOFTWARE HARDWARE: The Pyle 7 Inch Android Stereo Receiver runs on Android 5.1 with Quad-Core 1.2 GHz Cortex CPU. Features user-friendly UI interface, full touch screen tablet style functionality, 16GB built in memory. 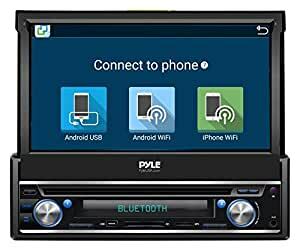 WiFi BLUETOOTH CONNECTIVITY: This vehicle audio video head unit features Bluetooth and WiFi streaming, allows you to play music, movie or surf the internet. Keep your eyes on the road during calls with the built-in mic for hands-free call answering. CONNECT YOUR DEVICES: The indash car deck console unit allows you to connect various devices such as iPhone, tablet, MP3, MP4, MP5 or any device w/ 3.5mm connectors to the AUX IN, USB port for flash drive or media device, and an SD card reader. DEPENDABLE NAVIGATION SYSTEM: This universal auto single DIN radio has an easy to use pre-loaded automotive navigation app software with integrated maps, turn-by-turn voice direction assistance, visual map guidance and statistics display. MOTORIZED FOLD-OUT MONITOR: The in dash car amplifier features a hi-resolution 7inch full HD 1080p display monitor with touchscreen control operation. It folds in and out in just a push of a button!